Does your hairdo stop you? Today’s Chicago Tribune features an editorial on women’s attention to their hair may be getting in the way of them getting a good workout. Any dudes reading this are all, “Does… not… compute.” But I’m sure plenty of you faithful female Haulers have had at least one instance in which you had to decide whether exercising was worth the time and effort necessary to clean up your sweaty self afterwards. I know this can be an issue for women of color; it’s a regular topic of conversation among the awesome chicks at Black Girls Run. Even U.S. Surgeon General Regina Benjamin has something to say about the fact that women who’ve recently gotten their hair done may skip a workout or two in order to maintain the look a little bit longer. Yes, guys, I’m gross. But I smell lovely (I promise! ), cutting back on twice-a-day washings has made my hair much healthier, and — most importantly — today’s workout is DONE. Join the revolution! Sweaty heads unite! Entry filed under: Reasons Why. Tags: body image, bootcamp, hair. Some hairdos can even be a contraindication in certain yoga poses! Can’t be doing shoulderstand with a ponytail…no doubt. 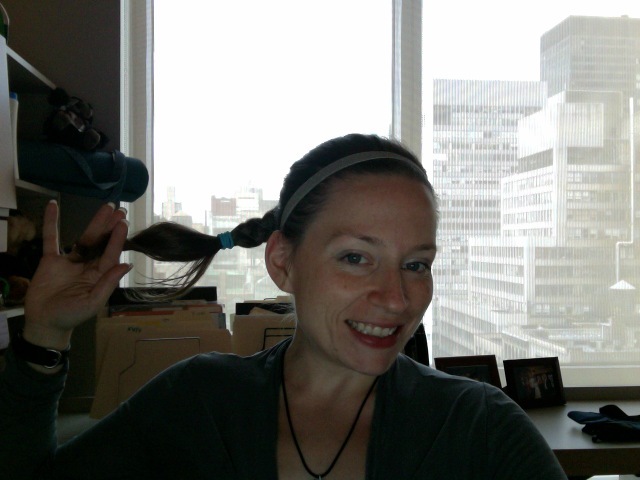 I often have to yank out my ponytail in yoga … interferes with savasna — my favorite pose!